Notes And Updates: We recommend using Corrosion Block® rather than Di-electric grease to protect electrical connections.Corrosion Block® since it provides protection at the molecular level, rather than simply a physical barrier as Di-electric grease does. The Blue Ox Converter is no longer available however a good quality one can be bought at most automotive parts stores. The 7 pin blade to 6 pin round adapter can also be bought at auto parts stores as well as Walmart. Jane and I recently acquired a 2002 Bounder 39Z Diesel. This coach was practically new, having been used for five months, then it was stored under roof until we purchased it. With only one trip back to the selling dealer for warranty work, Fleetwood certainly had not expended a lot of money under its warranty. I however, have spent countless hours correcting or re-adjusting items that were missed on the quality control inspection, or never properly installed. That being said, we are happy with our coach, which has many features that our previous 1994 34J lacked. It is interesting to me to see some of the additions on a coach that I had added to my old rig, now included as standard equipment, and to see some of our suggestions to Fleetwood incorporated into production. Caution: Do not use any type of screw to attach items to the interior or exterior of your Motorhome. The use of screws may damage the interior or exterior walls. If you want to attach items to the walls YOU MUST USE RIVETS. I wanted to place key hooks in the cupboard above the entry door and Jane wanted some extra towel racks in the bathroom. Other items would require wall mounting as time passed. I really did not want to rivet items to the wall, although I understood the reason for the caution. The mounting solution was the use of 3M Command Adhesive Strips to attach the hooks and fasteners to the walls. These are found at Walmart, Home Depot (and I would expect Lowes) and can be purchased in packages with the Adhesive fasteners only or with the appropriate hook. While these Strips are strong enough to handle the weight of a towel rack with two bath towels on it, their greatest advantage is they designed to be easily removed without leaving a trace of where they were mounted. At the bottom or each Strip is a small tab that, if pulled straight down, draws out the adhesive into a string-like strip that you continue to pull until it is free of the mounting surface. I discovered that the most important step in using them is to thoroughly clean the area with alcohol prior to mounting. The wallpaper paste found in the area around the border prints in our bathroom will prevent the Command AdhesiveStrip from holding. Once clean the only way to remove this strip is with the pull-tab. I have used them in various locations inside and in the cargo bays and they are performing flawlessly. Another alternative is a LePage product called No More Nails. It is applied by a caulking gun and it truly lives up to its name. Front Signal Lights: I have always noticed the 2001-2002 Bounder Diesel front signal lights, mounted low on the front cap, were very weak. I checked those on my unit and discovered that amber 194 bulbs were placed inside an amber lens assembly. These bulbs were also covered in tan overspray paint from the assembly line. Even cleaned and without the amber coating, these lights were woefully inadequate. I decided to replace them with 921 signal bulbs, which fit the base but are physically longer. They just fit in the housing and are much brighter. If left on constantly, they might generate excessive heat and damage the housing, however I believe the safety improvement is well worth the risk. Since I found water inside the housing I also coated the light socket with silicone sealant to seal it. Rear License Plate Lights: One of the light bulbs was burned out and it was rusted into the socket (just over one year old). I was able to work it out and clean the socket and its mate, then I applied some dielectric grease on the bulb bases and re-installed them. I then silicone sealed the complete assembly from the back to prevent future water and salt penetration. Tow Vehicle wiring: I had exchanged the 4 wire connector to a 6 wire one on my 1994 Bounder and with the 2002 I was faced with two situations. One was I now had a 7 wire trailer connector (requiring yet another complete rewiring of the pigtail and connector). The second was that the Coach had separate signal and brake lights. Although my tow car also has separate lights we had properly connected them together to use with the last coach. To avoid rewiring it I opted for a Blue Ox Taillight Maxlight converter ($45.00). The Plug-In adapter from 6 to 7 wire was another $21.95. With very little effort I was able to adapt the wiring and the tow vehicle lights are brighter now than they were when powered from our 1994 rig. 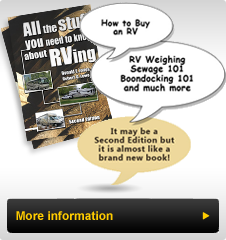 Both of these parts are available from our firm, RV-Parts Plus.